Series five was a gloomy time for Downton Abbey. Mary and Isobel pursued matches that were not destined to be resolved until the show’s conclusion. Mr. Barrow sought out a horrifying gay-conversion treatment. Bates found himself wrapped up in yet another murder. The new life brought to the big house by the arrivals of Jimmy, Alfred, and Ivy all came to an end. The show’s emphasis on change naturally required Downton as a house to move away from the pre-war glamour that defined the English aristocracy, but it did so about as sullenly as possible. As change happens gradually, time moves slower in certain areas. One of these was in the Dower House, where a certain butler went about his business as if nothing had changed since the war. Mr. Spratt entered Downton Abbey as an antagonist to the perpetually put-upon Mr. Molesley, though he quickly won over the audience with a series of light-hearted storylines that hearkened back to the show’s early years. From his quest to out Denker as an inadequate lady’s maid to his masquerading as the advice column guru “Miss Cassandra Jones,” Spratt was always a delight to watch. Full of one-liners and expressive physical comedy, Jeremy Swift played the part with a kind of refined charisma that radiated through the screen, a feat made all the more impressive by the fact that the bulk of his scenes were opposite the legendary Maggie Smith’s Dowager Countess. After a few series of rotating house staff, Spratt gave Dower House a kind of continuity that had been missing from the show. Dower House often seemed to exist frozen in time in the last two series compared to the drastic changes in the big house. As the servants in Downton began to make preparations for life after service, things went on business as usual under Lady Violet, with Spratt constantly there to remind viewers of the way things were in the early days of the show. I frequently criticized the overly drawn-out hospital plotline in my series six weekly recaps, which ate up much of the Dowager’s screen time in service of a losing cause. Spratt and Denker’s various quarrels gave Lady Violet some much-needed distraction from a plotline that should have been wrapped up in a single episode rather than a full series. I guess I should put this out there whilst the publicity is beginning but Spratt will not be appearing in #DowntonMovie. He was in the first draft but the script changed. I’m not fussed but don’t want to be asked about it for 2 years! The news that Spratt won’t be in the Downton Abbey movie came as a sad surprise, especially considering the high point on which Lady Violet’s butler ended the show, doubly employed by the Crawley family as both a butler and a columnist. While I don’t imagine that the constraints of a feature film would have much time for a character rather far down the depth chart of an ensemble cast, it’s certainly disappointing. I guess we’ll never know if Lady Denker finally learned the art of a proper restorative broth. Spratt may not have been an original character, but he was a big part of what made the show special in its later years when the time came for the big house to start resembling the change we all knew was coming. Dower House never embodied that change, and I can’t imagine any plotline of the film would want to push the timeline substantially more toward the present given the ages of many of the elder characters. It’s hard to envision circumstances for the movie that would not be conducive to a return appearance from Miss Cassandra Jones. Film adaptations of popular shows are best entered into with low expectations. A feature not only sets out to recreate the magic of earlier years, but tries to do so in a far more condensed timeframe. The movie will have many masters to serve in its leads and its plot, leaving little time for the supporting characters who carried the series for six years. And yet, it’s still sad that there is no time for Spratt, a character who quietly made his mark on a series whose reputation had long fermented before his arrival. I can only imagine the displeasure on the face of Dower House’s finest butler at the news, grimacing quietly as he resumed work presiding over his stamp collection. He showed his loyalty to the Dowager time and time again, from revealing Lady Mary’s adventures with Lord Gillingham to delivering Lord Grantham’s new puppy. The fans can ponder what advice Miss Cassandra Jones is offering to London’s finest, but it’s a damn shame we won’t see any of it on screen. Assuming that next week’s episode follows past trends and runs over an hour, we’ve just had our final “regular” sized episode of Downton Abbey. Feels like just yesterday we were wondering how Tom and Sybbie were getting on in Boston. Time flies, especially with change in the air. Rather than jump into the main plotline, I’d like to start with Molesley. Downton’s finest first footman hasn’t had much to do this series and there’s been little need for comic relief, but Kevin Doyle has quietly shined with the material he’s been given. As the show starts to wrap up some if its storylines tonight, it was great to see Molesley given his moment of triumph. The Dowager’s interactions with Lady Cruikshank were vintage Violet. It was hard to fully appreciate her zingers during the hospital storyline since she was so clearly in the wrong, but watching her pick apart Larry Grey’s fiancé almost made up for his absence in the episode. 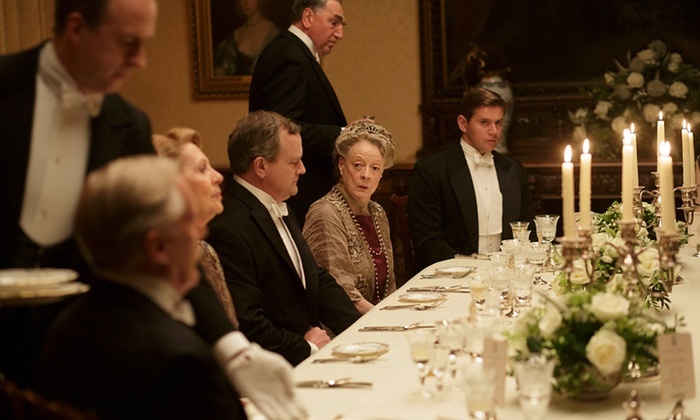 I do hope we’ll be treated to one more Larry Grey Downton dinner before the series is over. I do think it’s possible that The Dowager is lying about her whereabouts so she can be with Prince Kuragin. I hope not. Separating the Dowager from Downton this late in the series feels like a mistake. He wasn’t that interesting of a character either. Who really wants to see him back? I’ve felt the same way about the Isobel/Dickie romance, but it’s less of an issue. Lord Merton’s presence doesn’t really take away from the rest of the show. I don’t really care if the two of them end up together, but it hasn’t really dragged on at all. The Mary/Henry breakup was a big miss. It’s understandable that Mary should have cold feet after witnessing a horrific accident, but it’s too predictable. I’ve said this before, but I really wish their courtship had begun earlier since it’s been far too rushed. I understand the need to have some tension in the relationship, but there’s only two more episodes. I’m fairly undecided as to whether or not they’ll get married. 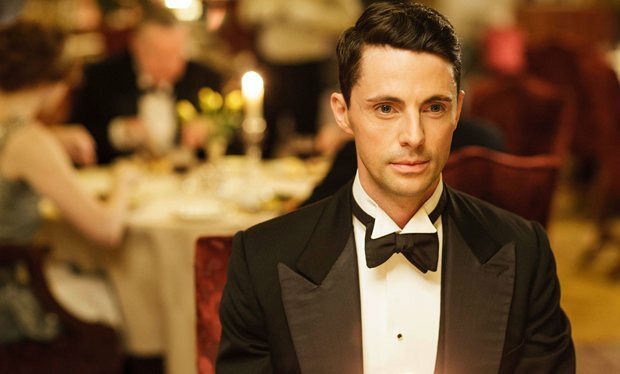 I hope they do since I’m a big Matthew Goode fan and it makes sense for Mary to want to settle down. The Talbot/Downton dynamic seems a bit odd, but at least Donk approves of the relationship. The drama in Edith’s relationship with Bertie is also fairly predictable. It looked like he wouldn’t care since he didn’t object to her having Marigold live with them, but that initial lack of concern could also be the reason why he might when she reveals the truth. Fellowes does enjoy making Edith suffer. Tom continues to play a supporting role, but he’s been quite entertaining. His role in the Mary/Henry relationship has been surprisingly well executed. Allen Leech recently gave an interview criticizing Tom’s resolution, which makes me wonder what’s going to happen to everyone’s favorite upstairs chauffeur. Why was Donk so rude to Rosamund? Does anyone care? I don’t. I wish he’d spit up more blood at that dinner, which felt like a funeral already. Baxter’s absence was understandable given the needs of the other storylines, but it did feel a bit odd not to have her there with Molesley when he received his big news. The two haven’t really had a “romance,” but their relationship has been a consistent high point over the past few series. I don’t think they’ll get married, but I hope I’m wrong. As inevitable as it was, the whole Carson telling Barrow to get a move on moving on feels so tired. They’ve had the same exchange twice before in series two and three only to have him stick around. Barrow’s heart to heart with Mrs. Hughes/Carson was nice and all, but we get it. He doesn’t want to leave. We the audience can feel for Barrow since many of us like him, but it hasn’t made for very interesting television. While it may be a little unnecessary to point out, I’ve found it odd that both Lady Rosamund and Lord Merton employ footmen. Footmen were becoming increasingly rare by 1925 and it undermines Downton’s supposed need to downsize, especially when Lord Merton is supposed to be a fairly simple man. If Lady Rosamund can have a footman, why can’t Downton have an under butler? Molesley’s departure also complicates the Barrow situation. It’s natural to assume that Barrow could be allowed to stay, but it seems like an anti-climatic way to wrap up a major plotline. I do suspect there will be more to it than that. Andy’s revelation was awkward, though I’ve mostly liked him as a character this year. I’m not sure why Patmore didn’t tell Carson that she’d been mistaken about what she saw with Andy and Barrow, though the two didn’t interact for the rest of the episode. It will be interesting to see if that factors in to the Barrow employment situation. Obligatory Bates mention. They weren’t miserable, though they didn’t seem too happy either. I’m not sure why Anna felt it necessary to try to go down to the wreck. Carson finally gets put in his place! Good riddance. I hope he got many blisters washing the dishes. Why does he even care about eating in the cottage anyway? Is he suddenly too good for the servant’s hall? I was very critical of the Daisy outbursts at Mrs. Patmore last week. This episode did little to persuade me that they were necessary. Daisy appeared in several scenes before the matter was even addressed and when it was, it felt like nearly every other Daisy/Patmore fight we’ve seen in quite some time. Completely pointless. As was the man outside Beryl’s B&B. Why do we need more policemen?Downton Abbey is not a detective show! Great use of Spratt this episode. I’m surprised he didn’t request an additional puppy for Dowager House. Denker could feed it with some of her delicious broth. His Donkship may want to move his dressing room downstairs since he seems to love going in the servant’s hall this series. That’s all for this week. A decent episode, though a bit somber. Let’s have a moment of silence for Charlie Rogers. I hate to say it, but I was definitely okay with the idea that Donk was going to die. As soon as he started erupting blood, I was reminded of Nate’s death fromSix Feet Under (and no, that’s not a spoiler. The show is ten years old). Lord Grantham’s death makes a ton of logistical sense from a plotline perspective. It seems unlikely that Mary could marry Henry Talbot with his Donkship still alive when he’d presumably need to move into Downton, especially after how Matthew objected to it at first even as the heir. It would also allow Carson to move on from Downton and pave the way for Thomas to become butler. Fellowes did say that not everyone was going to have a happy ending. The blood spitting was completely comical, even for a show as soapy asDownton. How is anyone supposed to feel the emotion of losing a beloved character when he’s recreating a scene out of The Evil Dead? I expected something bad to happen to Lord Grantham, but I didn’t expect it to make me laugh out loud. The question is, will Donk join Isis and the Turkish Gentlemen up in Downton heaven? It’s certainly possible. I did think this episode would be a bit early, but he could certainly take a turn for the worse next week. Counting the Christmas Special, there are four episodes left of Downton. If Donk dies sometime next episode, the characters could spend episode seven mourning the loss of one of the Canadian railway’s most ardent backers, which allows them two episodes to move on and wrap everything else up. With the time jump, it could be years later, making a happy ending possible. The Mary/Henry romance is being handled wonderfully. Mary’s snobbery is expected and not exactly unjustified either. Even in today’s day and age, there are plenty of taboos associated with wealth and social class in marriages. This has also been a great opportunity to get Tom back into the narrative in a productive way. We finally learned things about Andy! He likes pigs and he can’ t read, which is two more things we know about him than we’ve been told in the preceding six episodes. The whole “Andy is cold to Thomas” thing was getting a little old. He does seem destined for a pairing with either Daisy or Barrow, which should be interesting. The farm stuff was good and served as a great way to get Andy and Mrs. Patmore involved. I don’t think a Mason/Patmore romance is going to happen, but I like that they’ve built a little group outside the main house. Mr. Mason’s arc this series has been pretty incredible for a longstanding minor character. 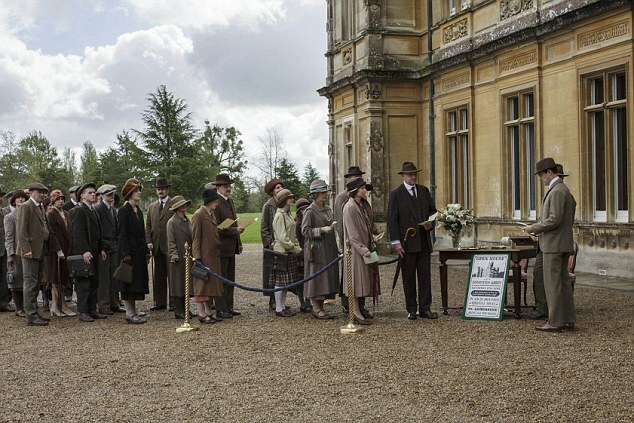 The show has done an excellent job incorporating Downton’s earlier days into this series. Barrow’s storyline is the only one that didn’t move forward at all. That’s okay, especially if he ends up leaving Downton, but no mention of it at all was a little old. There wasn’t room in the episode for another awkward interview, but a passing mention would have been nice. The Carson/Hughes scene was weird. I think we’re supposed to think that Carson is having trouble adjusting to an environment where his opinion isn’t the only one that matters, but he came across as too rude to really get behind him. I’d like to see a little more affection between the two. While I enjoyed its resolution, the set up to the Denker/Spratt throw down was a complete unrealistic mess. Are we really supposed to believe that Denker would stand up for the Dowager like that? Or that Dr. Clarkson would dare write a letter criticizing a member of her staff? If it wasn’t unrealistic enough already, we’re then expected to think that the Dowager would actually fire her lady’s maid over that. Why wouldn’t she use that as ammunition to prove to Clarkson that the people of the village are against the takeover? The Dowager has repeatedly noted that finding skilled staff is increasingly difficult and at her age, it might be difficult to find a good one who wouldn’t be able to find better job security somewhere else. Beyond that, it wasn’t anywhere near as bad as Daisy’s outburst, which was barely even considered a fire able offense. I love watching Spratt and Denker feud, but Fellowes couldn’t come up with a far more believable buildup. The Dowager is also back to being totally unrealistic and childish about the hospital. Her reasoning just doesn’t justify her behavior. Blackmailing Neville Chamberlain was mildly amusing, but seemed a little out of place withExorcist Robert. The same is sort of true for Mary’s Marigold revelation. I get why it happened because of timing and all, but I’m really not interested in seeing a Mary/Edith feud this late in the show. Given how quickly Donk and Tom processed the information, I don’t see why she couldn’t have found out later unless they’re going to make a big deal out of it. I’ll hold off fully judging this until we see more. I didn’t like how much focus there was on other plotlines after Donk’s bloody emissions. I haven’t liked how little we’ve seen of Spratt this series. I hated him for most of series 4 after he sabotaged Molesley’s audition, but Jeremy Swift is an excellent actor who really endears the character to the audience. Spratt’s spats with Denker have consistently been among the highlights of the show since her introduction last year. Speaking of Molesley, he continues to shine in his supporting capacity. I am concerned that we’re more than halfway through the series and he hasn’t been given a plotline beyond being Baxter’s support system, but Kevin Doyle is always a treat to watch. The end of the Baxter plotline was a little anti-climatic, but that’s okay. It’s not a storyline that needs to last the whole series. The Bates finally got to have a not so depressing scene! No harvest! No sadness! That’s it for this week. Despite the Donk theatrics, it was a very strong episode. I hope next episode brings something good for Molesley to do, possibly another cricket match. To end with a bit of self-promotion, the ebook editions for two of my books are on sale for .99 cents this week. If you enjoy these recaps and my writing, you may want to check out Five College Dialogues and Five More College Dialogues. Thank you for your support. While many hearts broke for Lady Mary following Matthew’s tragic death, my sympathies belonged to his valet. 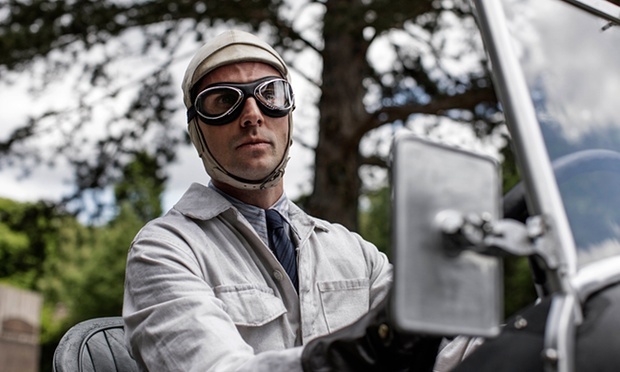 I spent the break between series three and four fearful for the departure of Downton’s great cricket champion. Thankfully, this did not come to fruition though the solution was less than ideal. Since Mr. Molesley has moved on to bigger and better things in the Downton schoolhouse, I wanted to take a look at his time as England’s oldest footman. I’ve long referred to the necessity for Molesley to be a footman as the “Molesley Dilemma.” It is ridiculous and rather implausible that a trained butler/valet would spend three years of his life working as a footman, unable to find any better job anywhere else. We the viewer know that Molesley is at Downton because the show can’t afford to lose the highly talented Kevin Doyle, but I don’t think that Julian Fellowes ever made much of an effort to explain why the character needed to be there. The first problem came about in the first episode of series four. Unable to procure employment, the down and out Molesley returns to Crawley House to ask the grieving Isobel Crawley for his old job back. A job he lost mind you, because Lord Grantham decided that Alfred wasn’t good enough to be Matthew’s valet. Now, we can kind of accept that a grieving mother may not have any use for a butler. Except for one problem. She’d take in the down and out Charles Grigg in the same episode! Hypocrisy? At least a little bit, though Isobel did try to have Molesley killed at the start of series two. It’s not as if Molesley’s wages wouldn’t be paid by the big house anyway. Which isn’t to say that I’m sad that Molesley didn’t return to Crawley House. He belongs in the big house, not as Ethel part two. There just isn’t a reason given why this solution to his character’s problem is cast away so flippantly. This problem surfaces again in series six. Barrow spends the entire series interviewing for jobs. Why isn’t Molesley looking for other work? It isn’t even mentioned once. We can accept that Molesley doesn’t want to leave and that he isn’t being pushed out. Molesley is also a fifty year old man with presumably zero savings. Once again the audience has a different lens to view the situation. There were hints that he would become a teacher in series five. That doesn’t excuse why he doesn’t once consider looking at other positions before he’s handed a job as a teacher. This wouldn’t bug me if there wasn’t such as easy explanation. Molesley could’ve simply said that he wanted to stay at Downton to be close to his father. A solution could’ve been had in a few simple lines. It’s hard to look at this situation as anything other than lazy storytelling. I’ve never been particularly appreciative of the humor surrounding Molesley’s position either, particularly from Carson. The butler forced Molesley and others to beg for a position clearly beneath his skillset. How stupid/insensitive is old Charlie anyway? This surfaced again in series five when Jimmy departed and we were treated to that “first footman” bit as if Molesley’s position should be a source of humor. As Patmore noted when Joseph was working as a delivery boy, “there’s no shame in hard work.” Seeing people take jobs that they’re overqualified for because they need to survive should be inspiring, not humorous. Of course that can be seen as making a mountain out of a mole(sley) hill. I’m okay with that. Downton is a show about change. There were plenty of people in service who had to take plenty of undesirable jobs because their positions no longer existed. As a show, Downton only seemed concerned about that when it was convenient to the plot. Barrow cannot find other work in series two and throughout much of series six (and is also faced with the need to depart in series three), but Jimmy gets another job in two seconds after he’s caught in bed with Lady Anstruther. A little consistency would be nice. Ultimately, it’s hard to argue that Molesley didn’t benefit from his fall from grace as a character. His relationship with Baxter would look quite different if he was still a valet with secure employment for the rest of his working days. My only problem is that it wouldn’t have taken much more to fully flesh out his predicament. Molesley’s time as a footman was an unfortunate necessity for the show. Kevin Doyle ran with the opportunity and used to it further endear the character to the audience. I certainly wouldn’t have written this article if he hadn’t done such a marvelous job. Naturally, this affection leads one to want the best for Downton’s most versatile servant, a character who always offered kindness even when he knew he’d received none in return.